The Seven Churches are thinly veiled summaries of biblical, historical highlights of seven millennial days. The term “church” may not be the most appropriate word for the Greek original term Ekklesia, which means a called-out assembly, a gathering. Such an assembly may include a gathering to any house of worshipers, synagogue, church, temple, or group on the street preaching God’s truths. Indeed, a building or complex need not be envisioned, for the idea is God calling the faithful out of the straying humanist world in which we have sojourned as strangers while awaiting the coming Kingdom of God. And, indeed, the Lord has been gathering the elect for His coming Kingdom since the days of Adam and Eve. Athough the seven assemblies serve as instructions for any and all Bible-believers, there is a hidden biblical history of millenniums for those who have ears to hear and comprehend what the Spirit is disclosing. After exploring the seven millennial assemblies, which are written on the outside of the sealed scroll, we will reexamine the seven seals of the Apocalypse as seven years. The first six seals concern the tribulation period of the elect, in which the people of God will suffer for His will and Word. Some Christians will not be gathered and sealed on the sixth year/seal and will suffer the Antichrist with the rest of the world until Christ comes. When the seventh seal is broken, we proceed to explore inside the scroll with the final year of the week, which is the time of great wrath- the “Year of Recompense” of God on revolting nations. The seventh year falls on the first year of the millennial Great Sabbath (a.k.a. the Day of YHVH), c. 2029 A.D. +/-4. Hence, the innermost contents of the book concern that which is opened when the seventh seal is broken. To emphasize this, there is complete silence in Heaven for about 30 minutes when the seventh seal is broken. During the final, seventh year, shofars (or trumpets) of warning will be blown, and with each of them one of the seven vials (or bowls) of wrath will be poured out. This will occur seven times to complete the final year. Although the seven trumpets and vials are presented as two separate series in Revelation, we find after exhaustive study that they are indeed one and the same series of events. They are presented in the book more than once to show that these things will “shortly come to pass” and to provide more than one witness of the coming judgment, just as the seven-year-week has other witnesses, as we shall see. For each of the 22 chapters of Revelation, I will begin with its letter and meaning from the 22 letters of the Hebrew alphabet. For example, Christ is the Alpha in the first chapter. While it is historical fact that the Book of Revelation was copied for Gentiles in coin Greek, whereby Alpha and Omega could be easily discerned for their significance as the whole Word of God, it is logical that the mentioning of the first and last letter in the first and last chapters of Revelation should pertain to the language that was considered most holy by 1st century Hebrews- i.e., Yeshua revealing the message from Heaven to Yohanon (John). The Greek alphabet originated from the ancient Phoenician alphabet, still utilized by Hebrews, and it originally began with the letter Aleph and ended with the letter Tav. Thus, the controversy over this should be minimal, and it should become self-evident as the mysteries of the book are clarified and chapters are correlated with their letters. In these articles, I reveal the Moedim Paradigm of biblical history in which all 22 letters, appointed feasts of Torah, messianic prophecies, similitudes, mysteries, and prophetic parables of Scripture concisely fit. 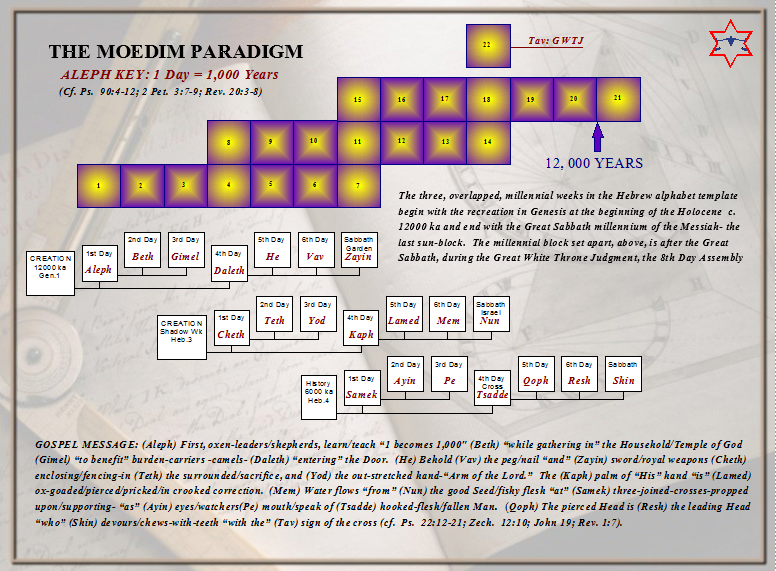 The Moedim Paradigm is the timely template upon which God created all His biblical mysteries of time, and it is only now revealed for the preparation and education of the elect, to preach the Gospel of the coming Kingdom. One of the first things for readers to consider, besides the context suggesting that the same John who wrote the last of the Gospels recorded Revelation, is that the introduction speaks of things soon to come, which, having been written by him almost two millenniums ago, seem to be somewhat of an overstatement for an end-of-age arrival. For explaining this, we must discern world-ages since Adam through the infinite eyes of God- in a panoramic view of an ancient world. A millennial week of city-state civilizations was determined since the beginning of Adam and Eve, and it was something known and expressed by Israelite prophets and early Christians; so the last days– from the cross to the Great Sabbath of Messiah- are merely two Divine days followed by a Great Sabbath millennium. As it is written in Psalms 90:4 and 2nd Peter 3:8, a millennium is like a complete day in God’s sight. For this reason, Bible-believers who understand Divine time often say things such as “the end-times” and “the end of days” while not meaning that days or time will be abolished, but rather that an appointed age or period of time will be complete. The apostles of Christ made it quite clear that even they were in the end-days, for they were waiting on what Jews call the Day of YHVH or the YHVH’s Day (only as HaShem, “the Name”), which are remembered with the shadows of the weekly Sabbaths. Hence, our perception of time must become panoramic to discern the redemption plan of God. The second thing that draws our contemplation is the fact that this message, which is a blessing for those who hear it and keep the Word, is addressed to seven, specific, 1st century Christian assemblies- ones that were once thriving congregations in Asia Minor. Yet the contents of the book mostly concern a transcending message about the coming of Messiah. This apparent anomaly has prompted many exegetes to misconceive the seven assemblies as progressive events occurring during the past two millenniums of the Church Age. While it is true that messages can be gleaned from the seven assemblies for all readers, we shall soon see that the true mystery of the seven assemblies concerns all seven days from Adam to the Great Sabbath of the coming King. Thus, while it appears as if YHVH is coming to Earth in full glory in the introductory passage of Revelation, the passage concludes by specifying that Messiah is coming in His Spirit, and even those who pierced Him shall see Him (a mystery we will soon expound upon). This correlates with the enigmatic Tanakh/Old Testament prophecies, for “They shall look upon Me whom they pierced” (Zech. 12:10), and “YHVH my Elohim will come- all the saints with You” (Zech. 14:5). In John’s record, we find that the word “kingdom” is sandwiched between their shared tribulations and their patient endurance- a patience shared with Christ. This simply shows that the elect await the Messianic Kingdom that will be manifest on Earth as it is in Heaven. This leads readers into John being in the Spirit on the LORD’s Day, which is, and always has been, the Sabbath, according to the everlasting Ten Commandments (written by God in stone) and Christ’s very own words, declaring that the Son of Man is also “Lord of the Sabbath” (see Luke 6:5). John’s account may also suggest that we, too, must be in the Spirit to perceive the truths of the coming Day of the LORD. Christ standing in the midst of seven lampstands shows His light going out to all seven millennial days of the Adamic Age, as the Beginning and End, in the first to the last letter of the Word of God. John was witnessing to the Day of YHVH and the patiently awaited Sabbath Kingdom, as well as the history and tribulations leading to it. Christ’s snow-white head has nothing to with our mortal skin tones; rather this was revealed to symbolize that purification through light, discipline through trials, and refinement- as with the golden band- are appointed to the longsuffering elect who await the Kingdom. His fiery eyes depict that the vision of His Body of Believers will be refined. His burnished brass feet shows that the refinement will be perfected at the end of the age- the end of the Body. As Christ explained to Peter, if the feet are cleansed then the whole Body is cleansed, and this mystery of being born again for the coming Kingdom will shortly be expounded upon. The long double-edged sword (rhomphaia) expresses that the Word of God has divided people down through the ages and continues to divide people until the G.W.T.J. For the elect His Word is like abundant rain from Heaven that brings refreshing and restoration, but the mouth of the sword facing the disobedient declares their ultimate destruction. For those who patiently endure, His Word is like sunlight for mortal life, and He arises as the Sun of Righteousness with healing in His wings, but the sun can also be scorching. For the elect, the sword of His Word is like a shofar or trumpet for preparations, even during trying times, but for those in rebellion it is a trumpet of warning of utter destruction, as it was at the end of Jericho when the priests blew their shofars for seven days then seven times on the morning of the seventh. Moreover, in the dualism of prophetic Scripture, the Book of Revelation did serve to instruct and chasten the seven ancient assemblies in Asia Minor, to keep the people prepared for the Lord. Yet when we acknowledge that those seven assemblies did not see all the events that unfold in the book’s passages, we should discern that they represent things that transcend the ancient assemblies’ place and time in history. The enigmatic words of the Messiah are all-encompassing, and this is what we should perceive when considering the first and last letter, be it Aleph to Tav among Jews or Alpha and Omega among Greeks: the Beginning and the End, the First and the Last. These things are greater than issues concerning some 1st century Christians, and even greater than the entire Church Age or Age of the Gentiles, for they summarize God’s work and Word of refinement since Adam. Most Bible translations have the word angels in the above passage where I insert only the meaning behind the term, which is messengers. The reason for this is because angel need not refer solely to immortal, spiritual beings, as commonly presumed when believers read the word in English today. In the 1st century, Grecians were more likely to first think of aggelos as an occupational role like an errand runner; perceiving the word to imply a spiritual messenger would have depended upon the context in which the term was utilized. This also applies to the Hebrew word translated from the Tanakh: malakh. Clearly some of these angels were also priests, prophets, and others who carried God’s messages. Likewise, the word stars refers much more often to humans, symbolically, in Scriptures than they do to heavenly beings. Logic compels us to consider that Christ, being in Heaven with the heavenly angels, would not need Apostle John to track down seven spiritual angels- who gave enlightenment to the seven assemblies- to deliver the Revelation messages to them. After all, the stars were in the Lord’s right hand when John was receiving the messages for the assemblies. Moreover, the messengers of the seven assemblies obviously represent the Lord’s work through people in this world. The messages delivered to John concern things that he had seen in the past, then-present things, and things that were to come. The messages concern time and Christ having the keys to release the prisoners of death and the unseen realm of Hades. The right hand of the Lord is the hand of salvation, and seven people would reveal His light to the called-out ones of seven millennial days, which extends beyond the immediate instructions to the Asian assemblies. Moreover, John was not being instructed to deliver the seven messages to seven spiritual angels over the seven assemblies, but to deliver panoramic messages of seven millennial days, in which seven particular messengers thereof shed light. These star messengers are biblical persons whose Revelation utterances (or laleo) were sealed as extended speeches or harangues for the end of the millennial workweek. In other words, they each have a summary of God’s biblical, historical works for their millennial day, which when unveiled testify to God’s works through Christ for the entire millennial week. For this reason, their messages were called the “mystery of the seven stars,” and only part of the mystery was revealed by Christ disclosing that they are messengers to the seven assemblies. These seven messengers are: Adam and the people of his day, for the Spirit of the Lord rested upon him; Noah and the people of his day, for the Spirit of Wisdom rested upon him; Moshe (Moses) and the people of his day, for the Spirit of Comprehension rested upon him; Yeshua (Jesus) and the people of His day, for the the Spirit of Counsel rested in Him; Kefa (Peter) and the people of his day, for the Spirit of Power rested upon him; Eliyahu (Elijah) and the people of his day, for the Spirit of Knowledge rests upon him; and the returning Great King (with a secret name) and the people of His Sabbath Day, when all will revere the Spirit– Christ with a name in which He alone knows. The message for each assembly is a recap of God’s work of salvation form the beginning of the age. Together, they are like a heavenly menorah of the Holy Spirit shining light in the Temple. Yet, Christ, the central BRANCH, is the manifestation of the Word spread throughout from beginning to end, from the first letter to the last. Thus, we should expect seven messages to be unsealed that correlate with the seven in a sequence leading into the Day of the LORD. In conclusion, the Hebrew/Phoenician Aleph, which became the Greek Alpha, has long been understood by Jews as a letter that depicts God teaching and leading us, and even herding us beyond our ignorance as cattle being led into green pastures. All the letters of Hebrew are alphanumerical, meaning they represent numbers. 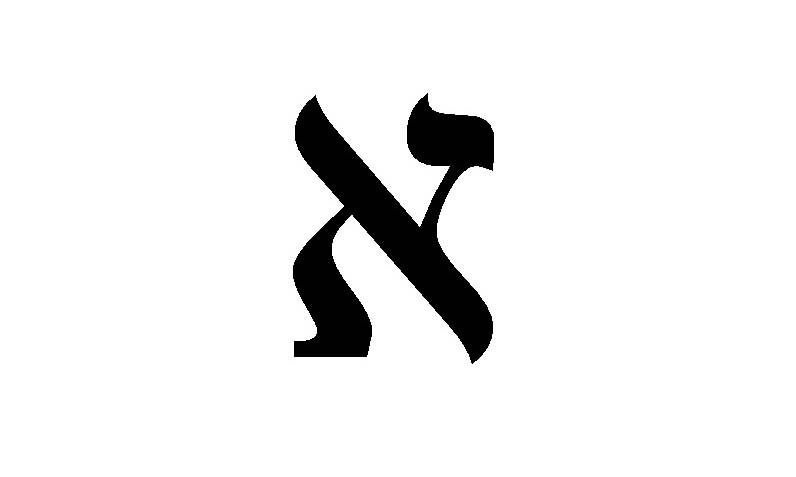 Aleph has a unique numerical value where its 1 becomes 1,000. This is the Aleph Key of biblical knowledge (or Key of Knowledge) for the coming Kingdom. This key rests in the Word of God- in Christ- and He has given it to us to translate us from the kingdom of darkness and death, ignorance in the unseen realm, to the Kingdom of Light and His life- His enlightenment. God gave His Sabbaths as a sign to the children of Israel, as a microcosm of the greater Day of YHVH to come. The Sabbath is the Key of the House of David, of the coming united Kingdom of all tribes under Christ, and the prophets and early Jewish Christians knew to use the Aleph Key with the Sabbath sign to understand what the Lord is teaching. God is in control of the history of His called-out people, and this plan has been determined since the beginning.